We’re going to be looking out for more stories like these, because elite corruption, crony capitalism and the cozy ménage a trois of big government, big business and big media are direct threats to the rule of law and the culture of virtue that make freedom possible. Go read the whole thing. China Doesn’t Have a Corner on the Elite Corruption Market. Published on August 31, 2013 in Economics and Stuff I Find Amusing. Closed Tags: Cronyism. 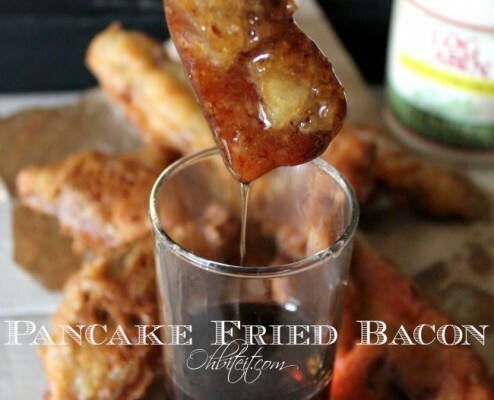 Pancake Bacon! Feast your eyes! The recipe can be found here. There is much that can be improved upon. For example, look at those photos, I don’t believe that just because it doesn’t have high fructose corn syrup that it qualifies as real maple syrup. That “All Natural Table Syrup” label is suspicious to me. There is no substitute for maple syrup. My several posts on the Great Maple Syrup Heist attest to my seriousness on this issue. Just need to wash that stuff down with coffee laced with bourbon. Published on August 30, 2013 in Entertainment and Stuff I Find Amusing. Closed Tags: Bacon, Bourbon for Breakfast, The Great Maple Syrup Heist. When I started this blogging effort, I was much more serious than I have been recently. When I started I did a bunch of stuff on education. I also dabbled in financial regulation. I soon gave up on anything related to kitchen design as that stuff moves at a snail’s pace and you could be current with one blog post a year. Lately I’ve been putting up stuff that, for the most part is kind of silly. There’s 10’s of millions of guys like me with a blog. There are hundreds of millions more using the Hello Kitty blogging tool. I’m not really carving out a niche here. There has been a bunch of stuff going ’round the web about Kashawn Campbell. I do recommend reading the original LA Times story before going on to the other posts. Education Realist is very good. Steve Sailer is his usual provocative self: Forrest Gump goes to Berkeley. As usual, many of the comments at both places are good too. You should watch that video, it’s short and funny. Those Japanese are pretty whacky! I’m off now to find a job. I’m still looking after five months. Pretty soon I’m going to have something to say about the job market and the skills matching problem. Published on August 30, 2013 in Public Education Nonsense, Stuff I Find Amusing and Stupid College Culture. Closed Tags: Statists, Steve Sailer. Oddly, Parliament may have more influence on whether we use military force than our own Congress. A.M. Links at Hit & Run. Published on August 30, 2013 in Stuff I Find Amusing. Closed Tags: Syria. We were talking about this just the other day. We saw a ’65. I was with SWMBO and the Ace. Of course I didn’t tell the Ace about the time my dad and my uncle were drunk and racing each other at night down in Baja. With both cars loaded with kids no less. Ah… The good ol’ days! 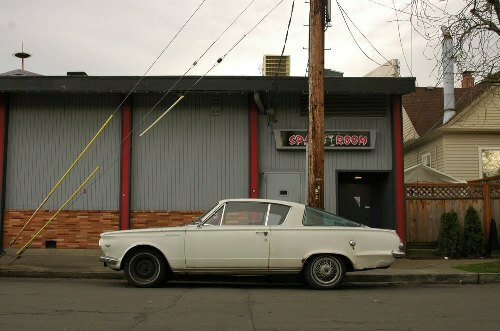 I found it at this blog: Old Parked Cars. You can spend some quality time going back through the pages there. Published on August 30, 2013 in Stuff I Find Amusing. Closed Tags: '64 'Cuda, Old Cars, Racing in Mexico. The Blonsky Device – Lowering the Bar. Kevin is a funny guy. He also has the patent application drawing on his web site. Published on August 29, 2013 in Entertainment. Closed Tags: Ig Nobel Prizes, The Blonsky Device. In a startling moment indicating either an educational system on the ropes, or a pretty significant grading error, some 25,000 Liberian students who took the admission exam to attend the state-run University of Liberia, failed. That’s every single test taker, reports the BBC. I don’t have any excuse for our tolerance of all the people on the fringes of college football getting rich while the real people doing the dirty work merely hope it pays off somewhere down the line. Go read ths whole thing. Published on August 28, 2013 in Dallas, Stuff I Find Amusing and Stupid College Culture. Closed Tags: College Football, Johnny Football. John Catsimatidis, a prominent Clinton donor who is running for mayor of New York City, told the Times that Chelsea “has to learn how to deal with the whole world because she wants to follow in the footsteps of her father and her mother.” Oh joy. Following in those footsteps would mean setting up organizations that rely on pledges from major corporations while your associates establish consulting firms charging those same corporations for “strategic advice.” Following in those footsteps would mean flying the banner of “charity” while you act as the middleman between multinational conglomerates and corrupt and indebted third-world governments. Following in those footsteps would mean relying on a cast of veteran stooges despite past failures and leaks to the press as they scramble to inflate their reputations at the cost of your own. Following in those footsteps means diverting a portion of the money pledged to the latest cause of the global elite, and using it to maintain habits of consumption and leisure worthy of Kublai Khan’s stately pleasure dome. via What the Clintons tell us about American democracy. I have always seen the Clintons as entitled political hacks. No doubt very skilled political hacks, but hacks nonetheless. Published on August 23, 2013 in Stuff I Find Amusing. Closed Tags: The Clintons. Somehow we have ended up in a completely backwards world where surveillance is aimed at private citizens doing private things but is banned for public officials doing public things. Ms. Hayes-White is obviously just a puppet for the firefighters union, and she (should) be treated with contempt. How Can People Say This Stuff With A Straight Face?. Published on August 23, 2013 in Stuff I Find Amusing. Closed Tags: Coyote Blog, Surveillance State.